Ok here's a better pic of Sibylla. I drew it on the bus. I seem to draw a lot of things on the bus. 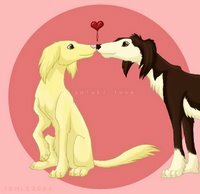 I did a Valintine picture of salukis too. On the bus. Coloured it yesterday. 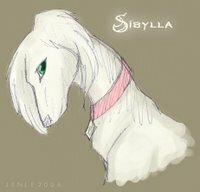 I'm thinking to entering it into a contest at DA. Eee so it's reading break! An entire week off...to study. Yep I've got so much to do. Math and biochemistry to study for. I've failed both compsci and matrix algebra midterms so I must do waaay better on the next ones. Bleh I hate math.